Wightlink said it was unusual for a group to "conduct such business via the local media"
Three businessmen are bidding to take over an Isle of Wight ferry operator, vowing to stop price rises and increase crossings. The Better Ferry Campaign, led by John Buckland, Nicholas Finney and Patrick Seely, aims to buy Wightlink and set up a Community Investment Company (CIC). The group has claimed the operator is using profits to pay off interest on high debts. Wightlink said it had high customer satisfaction levels among islanders. The firm, which operates services between the island and Portsmouth and Lymington, added: "Anyone... who wishes to acquire any business should contact its shareholder(s). It is unusual to seek to conduct such business via the local media." The campaign group, which has the support of high-profile islanders including Level 42's Mark King, said the firm's debts meant it put money first rather than customers. 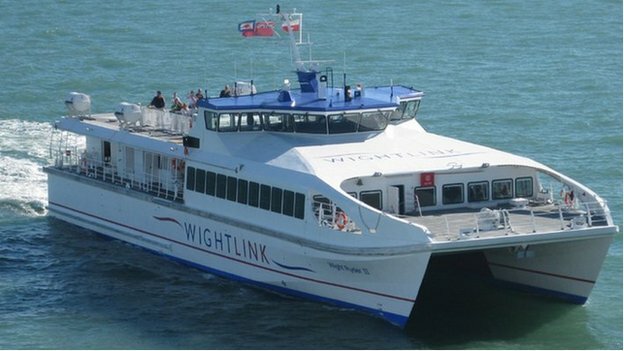 Businessman Mr Finney said the group's aim was to launch a CIC to restructure Wightlink and reduce its debts, which he described as "unsustainable". "We want to establish a dialogue to refinance the business. We really should be able to own our own connectivity to the island and have control over prices and services. "This connectivity issue is affecting all sorts of businesses and services on the island and we've got to address it now." The group said it would be talking to the council, wealthy islanders and and business groups about providing financial support for its business plan. Island MP Andrew Turner has also backed the group, writing on his website: "The two main ferry companies have very high levels of debt, so much so that Wightlink in particular is unable to serve the island's needs properly. "Services have been cut and prices increased recently with no consultation with their customers - that wouldn't happen in a properly competitive market." Wightlink added in a statement: "A survey in summer 2013 found 80% of customers rated our service as excellent or good. "Consultation with our customers is important to us. We regularly engage with islanders."